After Joshua and all the people in the generation that know Joshua are dead, the Israelites forgot about the Lord. They began to worship idols. The Lord was very angry with the Israelites and he let King Eglon of Moab to defeat and conquer Israel. King Eglon made the Israelites serve him for 18 years. The Israelites regretted that they had disobeyed the Lord by worshiping idols. They cried out to the Lord and asked Him to free them from King Eglon. The Lord heard their prayers, and he chose Ehud to kill King Eglon. 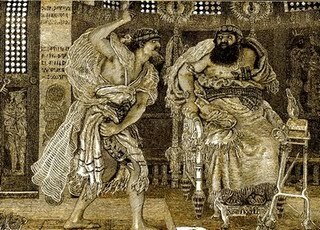 Ehud was responsible of paying tribute to King Eglon for the Israelites. But before Ehud went to pay tribute for King Eglon, he made a double edge dagger and strapped it under the clothes on the right thigh. King Eglon bade every servant to go out from his presence. Then King Eglon stood up and Ehud took the dagger strapped on his right thigh and stabbed into King Eglon’s stomach. The dagger went right out of King Eglon’s belly and the intestines spilled out. Ehud then shut the doors and escaped through the porch. The servants of King Eglon found that the doors of the upper room were shut up and thought that King Eglon is resting in his chamber. They waited for a long while and finally they became curious. They broke open the door and found that their master is dead. By that time, Ehud was already a long way off. When Ehud arrived home, he went to the mountains of Ephraim and blew a loud trumpet blast. The people of Israel went down the mountain with Ehud and killed 10,000 men of Moabites. So Israel overcomes Moab and they had peace for 80 years.